JONDACHI FEST INTERVIEWS - a behind the scene look at the goals of theERI and paddlers who participated in the first Class V race on thethreatened river. By Daniel Young | DBP MAGAZINE ONLINE The World's Best Free Whitewater Publication. 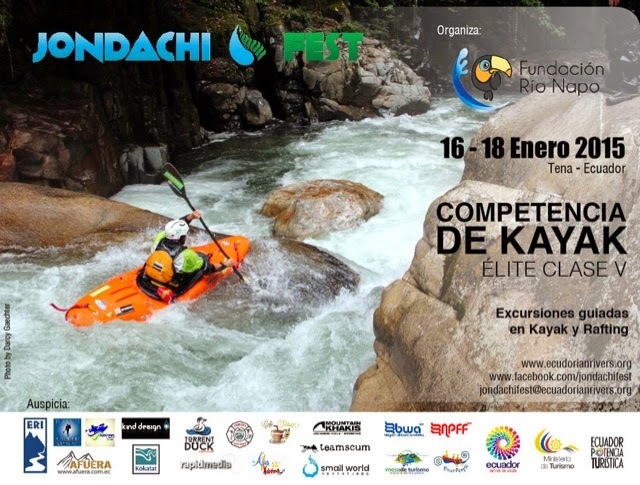 Jondachi Fest, held in Tena, Ecuador last January 16-18, was organized by the Ecuadorian Rivers Institute to highlight the ramifications to the local indigenous people and the paddling tourism industry of damming the river. Folks from all over the world converged to share their love of this beautiful place, to paddle it once again, compete in a race, listen to music, enjoy the company of like minded soul boaters, and hopefully make a difference. DANIEL: What was your overall goal with Jondachi Fest? 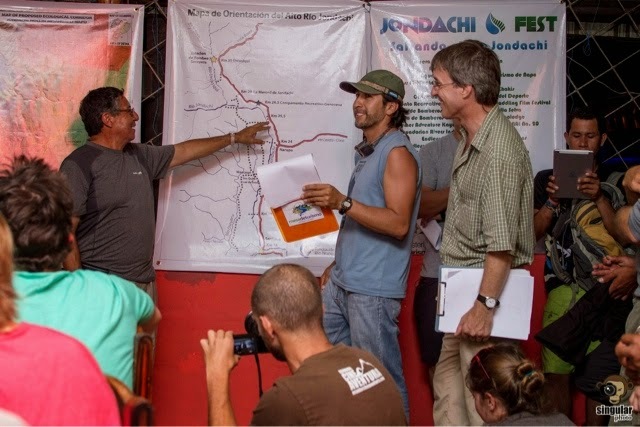 MATT: The main goal of the event was to promote the value and importance of the Jondachi River as a world-class paddle sports destination, as well as to make a renewed push for the designation and management of the Jondachi, Hollín, Misahuallí and Napo river corridor as a protected, free-flowing, wild & scenic watershed corridor between the Andes and the Amazon, to preserve its unique biodiversity and outstanding resource qualities for the benefit of present and future generations. DANIEL: Do you feel that goal was met? 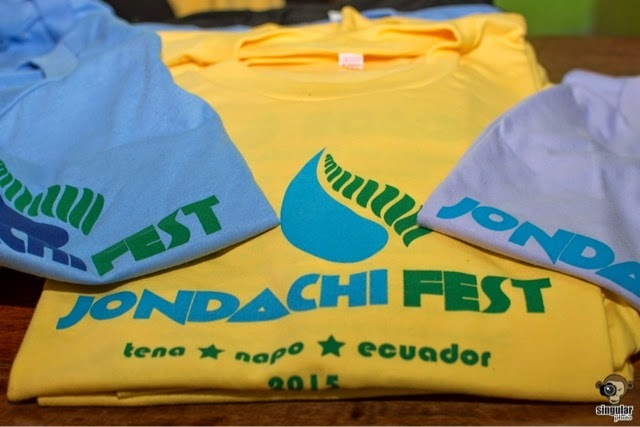 MATT: The Jondachi Fest provided very good exposure and surpassed our expectations in many ways. And it left us with a lot of follow up work to do. The Upper Jondachi Race is well-positioned to become an established race on the international circuit. 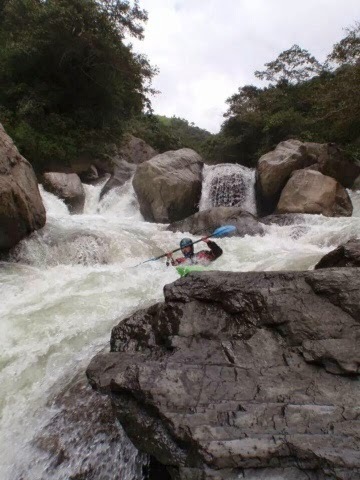 Also, there is now interest to develop a series of races on different rivers in Ecuador and use the races as an incentive for local paddlers and to promote the use of the rivers for whitewater paddle sports and tourism, and raise awareness about the need to preserve those resources. With the media attention and participation we received from the Upper Jondachi Race and the entire Jondachi Fest event, we definitely left no doubt about the importance of the Jondachi River as a paddle sports destination. The Jondachi-Hollín ecological corridor proposal was also in the spotlight. Judging by the positive response we have received during and after the event from key stakeholders, I think we can confidently say that we reached our goal of raising local awareness. The challenge now is to leverage our exposure to move things forward and make the protected river corridor initiative a reality. DANIEL: What are some of the negative effects the local population living along the Jondachi would suffer due to the proposed dam project? MATT: The Jondachi River flows through a steep, rugged and entrenched jungle canyon; nobody really lives directly in the river corridor – that is why the Jondachi River is still intact and pristine, and why we believe we can still preserve it. The Jondachi River is important to local communities for subsistence fishing, hunting, and other traditional uses and activities. The quality of life and cultural identity of local populations will be directly affected by any poorly conceived hydro project which diverts nearly all of the flow from the natural river channel, does not consider the needs of traditional and historic river uses, and forms a barrier to fisheries. 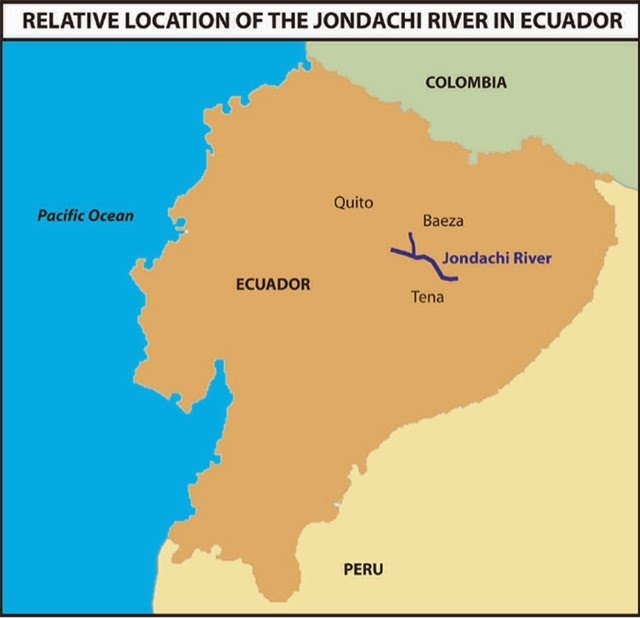 While the local communities should not be directly displaced by the project, the proposed hydro project on the Jondachi River would specifically and detrimentally affect recreational use, tourism and the ecological integrity of the Jondachi watershed and the representative biodiversity of the Sumaco Biosphere Reserve in the Upper Amazon basin. 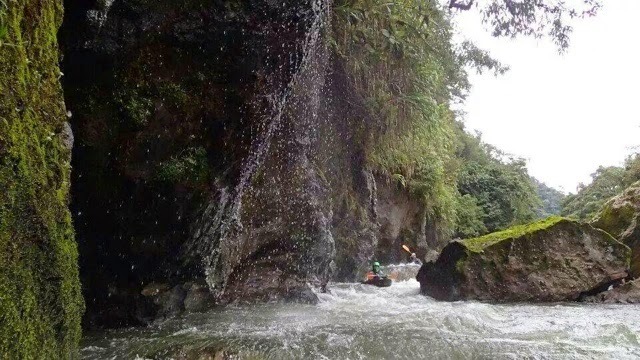 Local restaurants, hotels, transportation services and everyone in the tourism sector of Ecuador are dependent on the Jondachi River as a hallmark tourism destination that brings in new resources to the local economies. 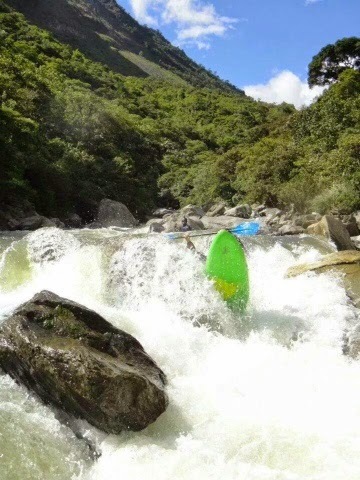 A growing community of Ecuadorian and international paddlers are concerned about the loss of one of the best whitewater rivers in the country, and one of the most important free-flowing watersheds in Ecuador that connects the Andes to the Amazon. 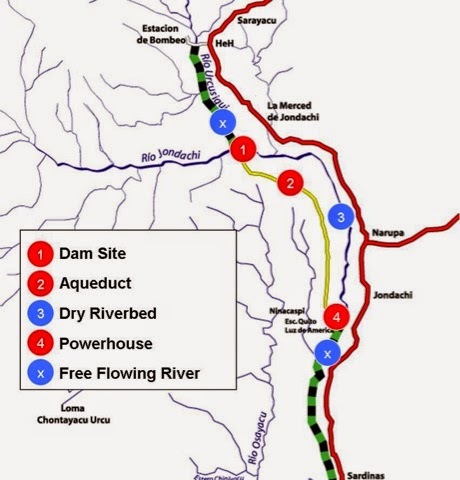 In the end, the real impact from developing a hydroelectric project on the Jondachi River would be the elimination of an emblematic natural resource with unique habitat and the loss of opportunities and sustainable economic alternatives for the local population in the future. DANIEL: As a whole how do you feel the locals were affected by this event? MATT: The Jondachi Fest turned a lot of heads and gave people a lot of pride, inspiration and motivation about the quality of their rivers and natural resources. 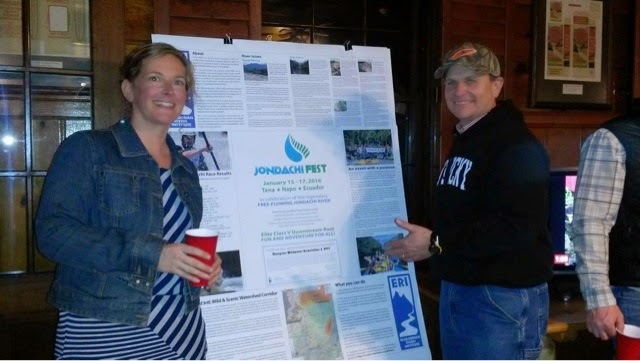 We raised awareness and attention about the importance of the Jondachi River for tourism, and more people learned about our proposed alternative to preserve the Jondachi River as a protected, free-flowing wild & scenic watershed corridor. DANIEL: What do you feel the general standpoint of the non-kayaking populace is with the dam projects proposed in Ecuador? MATT: Similar to many places in the world, it is difficult for people to be concerned about something unless they are directly affected by it. 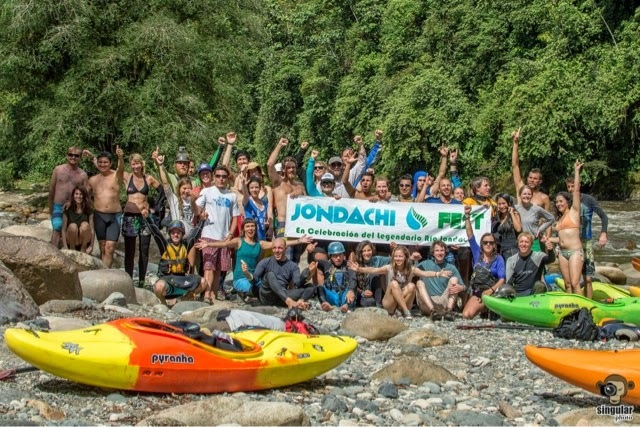 Creating connections with the resource and getting our message through to the non-kayaking population about the issues and the alternatives is one of our biggest priorities, and one of the reasons why the Jondachi Fest event was so important. In general, most Ecuadorians do not question development decisions and view any project as forward progress that will bring more potential benefits, jobs and opportunities. By offering minimal compensations, developers are usually able to negotiate with communities and land owners for access and popular approval. Hydroelectricity is endorsed and promoted by the government and major environmental groups as the renewable energy solution for the country, and most of the population accepts that rivers may be indiscriminately developed in order to have electricity, even if that means eliminating a tourism attraction or de-watering the largest waterfall in the country in order to have more electricity. The majority of the population, and government authorities, do not perceive any impacts from hydroelectric development, and they do not understand or appreciate the value which certain rivers or sections of rivers have as tourism attractions and natural heritage sites, and are not aware that there are many other alternatives for developing renewable energy. Furthermore, the recreational use and tourism on the Jondachi River is not directly visible to the local population. 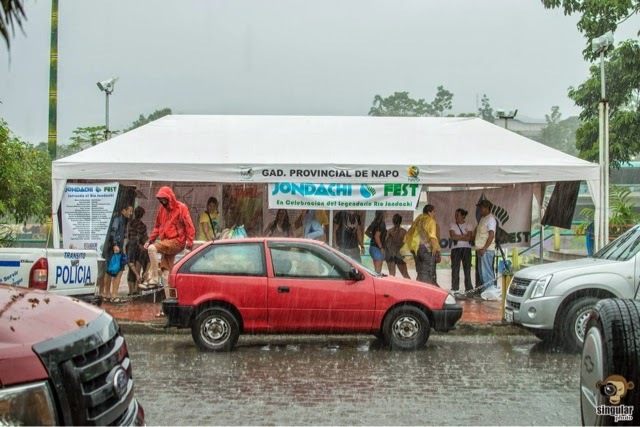 With these realities in mind, the Jondachi Fest provided an excellent public outreach platform to educate the local population about the value and importance of the Jondachi River for tourism and recreational use, as well as a free-flowing riparian watershed corridor in the Upper Amazon basin that should be preserved as a national park. DANIEL: What do you think it will take for the Ecuadorian public to see what is happening to their natural resources? MATT: More events, more education, more exposure, and more Ecuadorians getting out and enjoying their natural resources. DANIEL: What do you feel are some of the most successful accomplishments of the ERI in the past? MATT: The ERI has represented the interest to preserve emblematic rivers used for whitewater paddling and other recreational uses in Ecuador for the last 15 years. The processes we engage in and issues we are addressing are very complex and often span the course of many years. Our greatest accomplishment has probably been having the commitment and perseverance to overcome many obstacles to becoming an established and respected river conservation organization in Ecuador which is dedicated to encouraging the designation of outstanding river resources for permanent protection and the consideration of recreational river use and paddle sports tourism in watershed management and development decisions. The ERI has defended the interests of recreational river use on rivers throughout Ecuador; the ERI presents realistic alternatives and solutions for natural resource management, renewable energy and sustainable development; the ERI carries out watershed monitoring activities; the ERI created the Napo River Festival and other events which include local participation and have brought international attention to the paddling meccas of Tena and Baeza in the Napo watershed; the ERI has suspended illegal mining operations; the ERI has stopped the development of hydro projects; the ERI has taken watershed issues and environmental flow considerations to the highest courts in Ecuador; the ERI has influenced development and required new studies to be carried out for projects, and has maintained an opposition to the development of a hydroelectric project on the Jondachi River for over 10 years. The proposed alternatives and strategies developed by the ERI have been used as a reference for other river conservation initiatives in the region and around the world. The ERI has accomplished a lot. However, our work is never over and we have much more to do. DANIEL: What will your next focus be for the ERI? 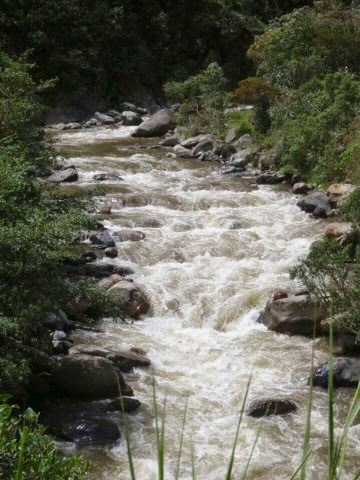 MATT: We have one focus – to protect and conserve unique watershed resources in Ecuador. The strategies we use are specific for each river and issue. Our priority right now is to set a precedent for the consideration of recreational river use in watershed management decisions by stopping the development of a hydro project on the Upper Jondachi River through the Jondachi Legal Defense, and directing new hydro development to more appropriate sites near existing hydro projects or on rivers of low resource quality, that are already impacted, are closer to the population centers and existing roads and transmission infrastructure, and which do not have conflicts with other river uses, including recreational use and tourism. Likewise, the Jondachi-Hollín-Misahuallí-Napo Ecological Corridor is at the forefront of the ERI’s agenda, and is presented as a conceptual model for an international wild & scenic, free-flowing, protected river designation and conservation program. DANIEL: Were you surprised by the turnout of so many foreign kayakers? Do you think you might host this event in the future? MATT: We expected a lot of international paddlers. The number of local paddlers who participated in the race was the biggest surprise and a promising sign for the future. All signs indicate we should keep moving forward. If the ERI didn’t organize the Jondachi Fest, who else would do it? DANIEL: If you were to send a message to the international kayaking community what would it be? MATT: We need to make a collective effort to establish an international wild & scenic river protection program to preserve strategic whitewater resources around the globe. We also need to be seen actively using these resources. 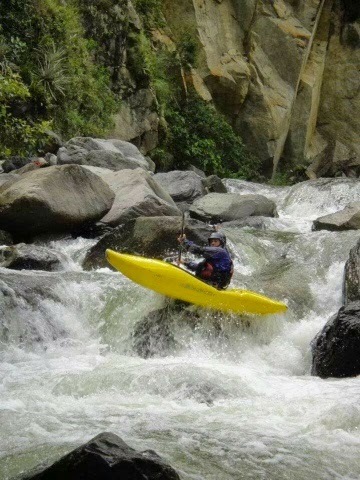 Be an international kayaking ambassador and keep traveling to Ecuador and your other favorite destinations to paddle. Bring some friends and be sure to let the local population know their whitewater river resources are important and worth saving. DANIEL: I understand that most of the ERI’s support comes from volunteers and donations. Is there a website where people can send in donations? MATT: The ERI needs committed, bilingual volunteers with professional skills and experience in Ecuador to help bring in funding and work on strategies to develop and implement the Jondachi-Hollín Ecological Corridor. Send resume and inquiries to [email protected] if you are serious about getting involved. Emphasizing Matt’s point, Daniel also interviewed five paddlers from all over the world who raced: Mathieu Arcand (Quebec, Canada); Aurelien Leroy (France); Laura Farrell (Bryson City North Carolina); Galen Volckhausen (Ithaca New York); and hometown boater Gregory Andy (Tena, Ecuador). Their mix of answers show the diversity of our sport, paddlers from all over the world flocking to one river to commune and make a difference. From a relatively new boater to longtime pros, Jondachi Fest gathered folks from all spectrums to the heart of the jungle to help save a river, and highlight the battle being waged against dams by indigenous people across the globe. DANIEL: How long have you been kayaking? And how long are you in Ecuador? MATHIEU: 2 years. 3 months. AURELIEN: 20 years. 1 1/2 months. LAURA: 13 years. For about three weeks. I extended my ticket to participate in this event. GALEN: 19 years. For one month but I also extended my ticket to stay and compete. GREGORY: 14 years. I live here! DANIEL: Have you competed in other extreme kayak races and where? What do you think of the Rio Jondachi course? MATHIEU: No, this is my first. Really great for a fun time. AURELIEN: Deiby du Veneon, France. Yea it was nice, uhh, maybe not the best for viewing..not so easy for those not kayaking. LAURA: Green Race in North Carolina, Ekstremsportveko in Norway, Valesia in Italy, Russell Fork Race in Kentucky. It is a good course for the purpose of the festival and a good location to have media coverage. Not necessarily the hardest, more of a focus on saving a river and publicizing the festival and the race. GALEN: Gran Prix in Chile, Rey Del Rio in Chapas Mexico, North Fork Championship in Idaho, and the Little White Salmon Race in Washington. It was great. 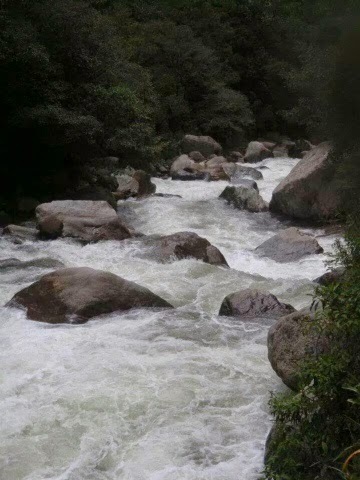 It included some of the harder rapids on the run but more importantly, it was symbolic that it started where the dam is sited to be, which is huge. Also good because it was easy to scout for those not as familiar with the run. GREGORY: In rafting races on the Rio Quijos and Upano in Ecuador and for the Ecuadorian national team in Korea. It is a good section of river, class 3 however would be better, to hold it at a location where you could promote the event to the non-kayaking community. The people maybe didn’t come because it was too far so pretty much only the racers and volunteers came out. DANIEL: What do you think the event could use in the years to come? MATHIEU: Lunch at the take out? Help with the race lines and more exposure. The tanks of water they had were great! AURELIEN: Maybe a longer race course. GALEN: More online and social media promotion. GREGORY: To hold it closer to the bridge (the end of the upper and start to the middle) so more people could come watch. DANIEL: How do you feel that you were received by the locals? MATHIEU: It is good, really easy to paddle here, like paddling at home but warmer. AURELIEN: It is nice because the locals are happy to help you to discover new rivers. LAURA: Paddled the last two days with the Banos kayaking club and everyone seems very excited to have us here. GALEN: A great reception, especially in Banos. I was given the name of a local kayaker there and ended up running into him at the bar and paddled with him later. GREGORY: Great! It is a good chance to learn about other people and their styles and technical skills. This is one of the reasons I’d like to travel. DANIEL: Would you compete again? 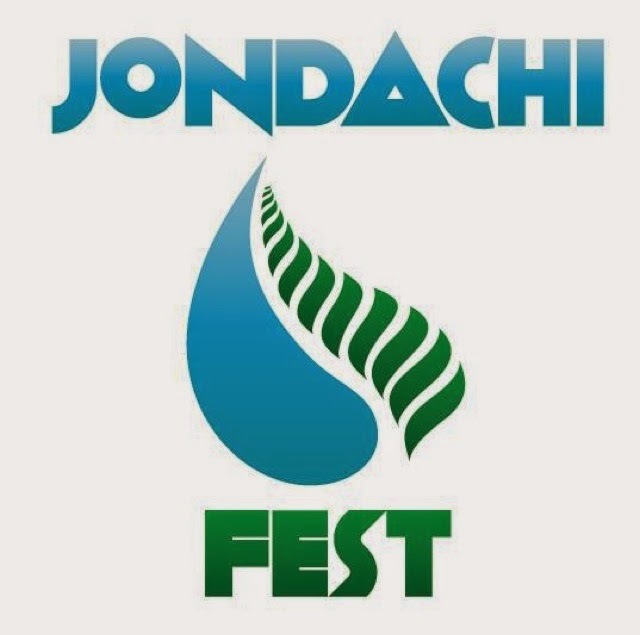 So make plans for next year’s Jondachi Fest! Save up some time off and some bucks for the flight to South America, and you’ll be glad you did!